Update: Since writing this article I have also written another article on a very similar theme What Can Goethe Teach Us About Happiness? which you may also be interested in reading. 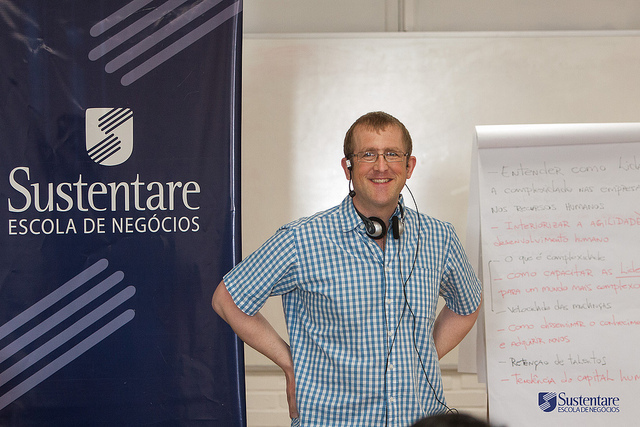 Last weekend I spent another two very wonderful days at Sustentare Business School in Joinville in the state of Santa Catarina, in the south of Brazil. I had been invited again by my good friend Prof. Wilmar, and I didn’t even need a second to agree to come down again. Joinville is a small city by Brazilian standards, and is surrounded by some wonderfully rich vegetation, including the really important and biodiverse areas of mangrove. Oh, and they have restaurants here in the countryside where hummingbirds join you for your entire meal. Amazing. 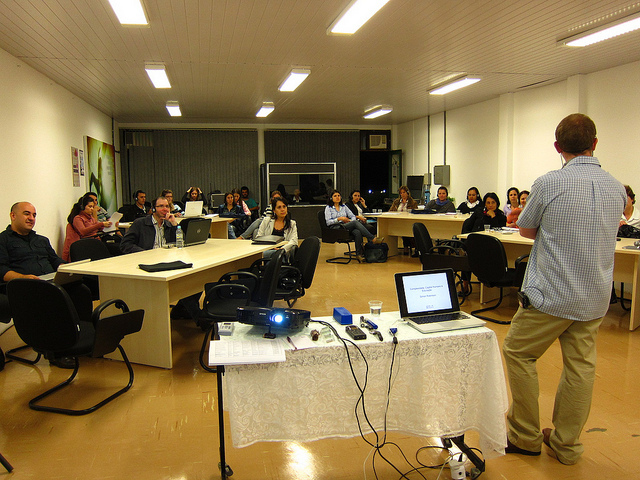 The course I was teaching was the two-day module Complexidade, Capital Humano e Educação, i.e. complexity, human resources and education to a class who were mainly from an HR background.The whole course, Organisational Training, Development and Development takes place over six modules, and is aimed at business executives and managers with MBAs and masters degrees, with each module being taught by working practitioners, as opposed to purely academic teachers. As you may well know from reading this blog, my teachings are based on the following premise. Obviously the students are there in order to learn about and discover new business models. My teaching is all about being inspired by nature, and so what I teach is the new business models which have been inspired by models of structure and organisation in nature. This is not necessarily to be confused with “systems thinking” which is now almost becoming an overused term. While “systems thinking” is now entering into business thinking, the danger is that those who attempt to integrate systems thinking into business thinking do so from a mechanistic world view, or perhaps “paradigm” (although I am not a huge fan of that word). What I attempt to do is before looking at natural systems, I look at mental models, and especially the dynamics of seeing and thinking, as taught primarily by Henri Bortoft. The reason I do this is to help students first make the move from mechanistic thinking to organic thinking, something that it is actually quite possible to miss in certain books on systems thinking. 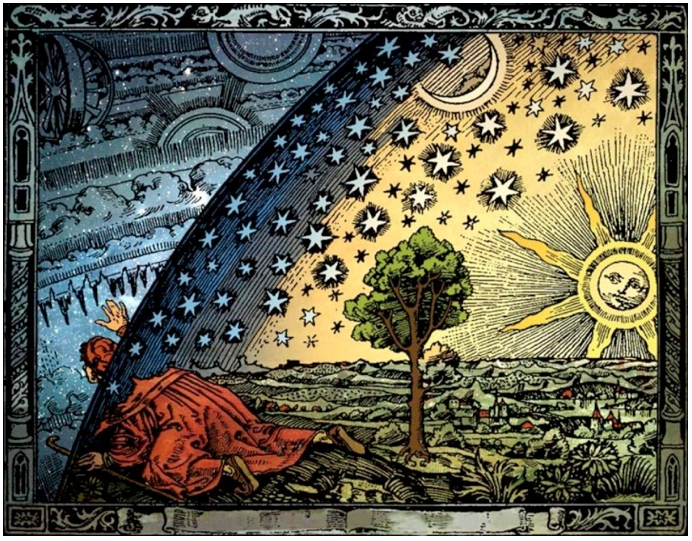 I love this image by Camille Flammarion, L’Atmosphere (1888). I used it to discus early on with the students the movement of thinking that scientists have had to go through to really understand the cosmos, the universe, and our place in it. Business thinking is not like this, and for me what I attempt to do is to take students through the history of science, not in terms of the scientific discoveries, but from the point of view of what I call the movement of thinking. If we look at the scientist in this picture, they are moving far beyond the common sense view of the world, one of separated and solid objects existing independently in a fixed time and space, to a new view of the universe which can only be truly grasped having undergone what is almost an alchemical process. The scientist is no longer an independent observer, but plays an active role and becomes open to being changed by the very phenomena he or she wishes to explore. This process can be extremely uncomfortable one at times, and I have gone through it. The whole masters degree I took at Schumacher College takes this perspective, in that the student has to move far from their comfortable world of fixed knowledge, and has to work hard to dissolve their limiting paradigms and frameworks, to enter into a radically new way of knowing and seeing the world. Learning is less about the transmission of facts and knowledge, and much more about being taken through this movement in thinking so that you come to really be able to experience the meaning behind the words of what is being taught. We covered a huge amount of ground on the first night of the course, and we looked at many different examples of dynamic organic systems; slime mould, termites, the human heart, the North Atlantic food web, right up to James Lovelock’s Gaia theory. We also spent time playing with prisms, trying to understand the difference between Newton and Goethe’s two very differing theories of colour and light. Having previously taught Goethe’s theory of colour, I wanted to move into an examination of his theory on the metamorphosis of plants, and to do so I decided to experiment with the slide of the three potatoes you see in the photo above. (I have previously written about what this picture means to me). 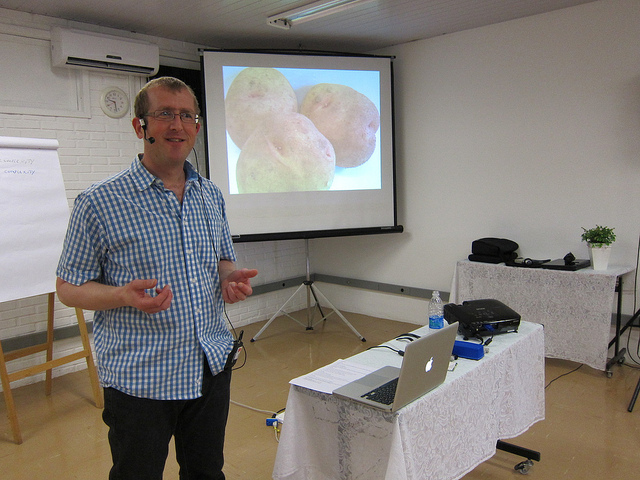 Having looked at a number of case studies in the first half of Saturday morning, the students had their coffee break and I then felt emboldened enough to ask the following question – how many potatoes can you see? I had no idea what the answers or indeed the reactions would be, but the resulting conversation and observations by the students just blew me away with their depth and creativity. Within their differing answers, I could really perceive a movement in their thinking, which this question was designed to provoke, and many used this as an opportunity to really explore what they were seeing, and in particularly moving away from a static picture into the dynamic way of thinking. Amazing. Only after having looked at what Henri Bortoft terms The One and the many, do I then discuss the case study of Ford and Toyota ans their production systems, where it is this precise way of seeing organically and dynamically is needed to really be able to appreciate Toyota’s Total Production System. (Again, I have previously written about this). The above image has been posted many times on Facebook, but I do not know the original creator. But it is a wonderful summary of the journey that both myself and my students went through in two days. The final part of the course are practical workgroups, examining how this new way of thinking can be applied in their organisations, departments and teams, and the energy was high and the conversation animated. You know, I really believe that to really solve our world problems, we need to rapidly move away from an obsession and imprisonment of purely mechanistic thinking. As I proved to myself, when a course is designed to lead students through this movement of thinking, and avoids the traps of confusing students with needlessly complicated philosophical jargon such as hermeneutics, ontology, epistemology, words which I sometimes suspect are used to impress rather than inform, then this movement of thinking can be achieved and experienced in a relatively short space of time. By the end of the course, during the practical exercises, students had fully integrated the new concepts such as systems, seeing, mental models, leadership, emergence, self-organisation, meaning, dialogue, and wholeness in a way in which I just don’t think they would have done prior to the course. This for me was what was so rewarding, having an opportunity to work with such an intelligent, engaging and attentative group of students. A teacher really can not ask for more. 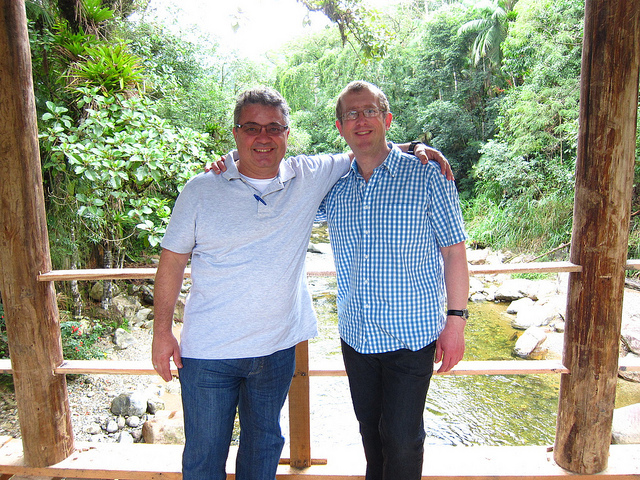 I was of course very much helped with the translations into Portuguese by profa. Valéria Barreira, someone who is not only a very excellent translator, but who also has an interest in, and very much understands the science and thinking that I am treaching. It is to prof. Wilmar’s credit that he is so focussed on providing students with the very highest quality of teaching, and for me, as someone who teaches by really going deep into my own intuitive knowing, could only do so with this level of support meaning that I really did not have to worry at all about the translation, but focussing entirely on taking students into the interpretation of words in their own language to discover new and deeper meanings within them, and hence uncovering the mental models behind the words and concepts. This movement of thinking, from the mechanistic to the dynamic and organic has huge implications for the whole of an organisation, for innovation, creativity, strategy, dialogue and leadership. I think that now what I will be doing is as well as offering courses such as these, to begin to look at coaching for the leaders and executives of organisations, those who really do not have the time to commit 12 hours in a single session. To paraphrase Einstein, we can not solve problems at the same level of consciousness that created them. We can not keep a hold of frameworks and paradigms which no longer serve us. 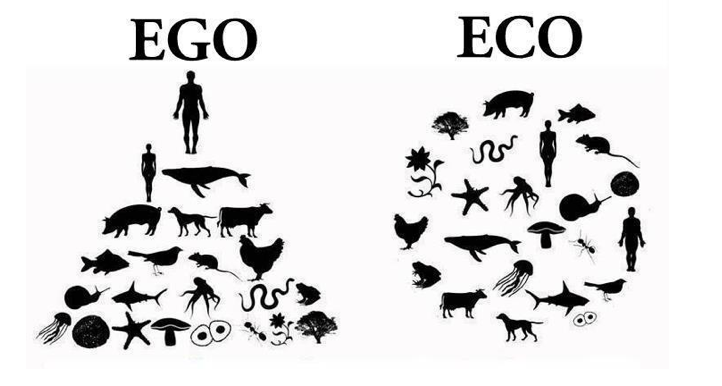 We need to go through a transition in consciousness, our consciousness, and then, and only then, will we all really be able play a role in making our organisations, their communities, and the world a better place. Cheesy I know but I really mean it. How many potatoes can you see? Thank you for your kind words about Sustentare! Everybody in our team works hard here to give better support to our students. We are committed to doing our best ever. I would also emphasize the importance of “we need to go through a transition in consciousness, our consciousness, and then and only then, all we really could play a role in making our organizations, their communities and the world a better place. “. Prof. Aluizio Vilar, M Sc.